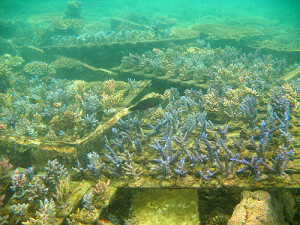 Coral farming has come on in leaps and bounds in the last ten years, no longer do we need to rely on wild harvested corals for the aquarium industry. Initially it was only certain species of SPS coral that were being sustainably cultured but now there are vast numbers of LPS corals that are being farmed as well. Huge fields of maricultured corals such as Lobophylia, Goniopora, Blastomussa, Trachyphyllia and many others now exist in the tropics. Since 2010 Reefworks-Trade has been making regular trips to the tropics to help set up new coral farming projects and establish relationships with existing coral farms. This dedication means that we are now able to import some of the best corals in the world. These close relationships that we have developed with our partners means we are able to advise them on the best corals to farm and which corals are fashionable in the UK aquarium industry. Our partners around the world are specifically chosen for the sustainable way that they farm corals and the high colour, high quality stock. We now regularly import many corals that are almost impossible to obtain elsewhere. 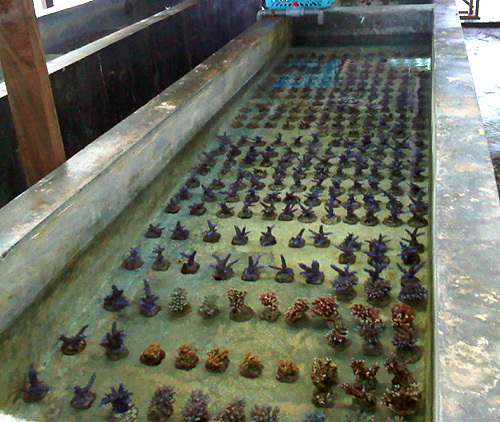 Our aim is to provide the UK with an unrivalled wholesale supply of sustainably farmed corals. For far too long UK retail outlets have struggled to source very high quality corals here in the UK, those days are now over. As we spend more time developing coral farming techniques and seeking out new stunning varieties of coral to grow with our partners, we will be able to offer you the retailer an ever increasing variety of stunning corals! All of our corals are carefully selected for high quality, they are then removed from the coral platforms in the sea and transferred to holding raceways where they are rested for several days before shipping. During this time the corals are closely inspected for health and good colour and then packed up and shipped to our holding facility here in the UK. 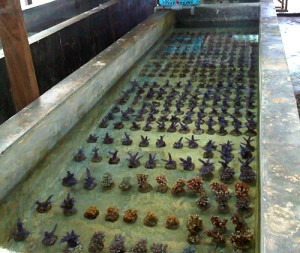 The corals are then rested for several more days during which time they are inspected again for high quality and colour and then released onto sale. 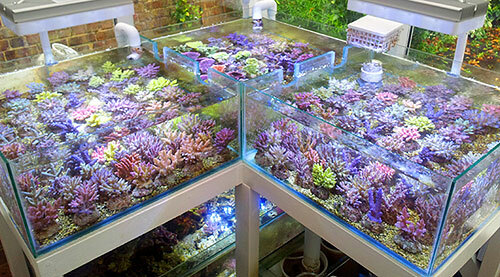 When we receive the corals here in the UK we continually monitor them to see which corals do best in aquarium systems. Invariably there are certain species of coral which do not maintain their colour well in aquariums, if we find a particular colour morph of a coral species that is like this then we stop importing it and advise our partners in the tropics to switch to another parent colony so that we can find a variety that maintains great colour in aquariums. This takes time but already we have identified numerous parent colonies that maintain exceptional colour in aquariums. As time goes on the corals that are famed in the tropics end up being only species that look spectacular in aquarium systems. We will be making more trips to the tropics to develop new partnerships with coral farms in other parts of the world, help develop new techniques for farming those tricky species and seeking out those spectacular new corals to start sustainably farming.